There's a lot going on in this photo that speaks to qualities like perseverance, dedication, efficiency, and civic-mindedness! 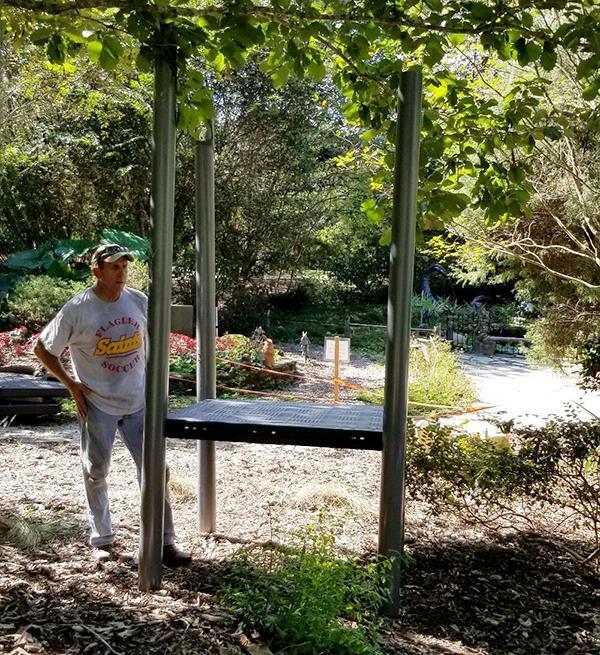 Playground foreman Cleve Cooper and Rick Medina (an all-volunteer outfit, by the way) have been plugging away with the good folks at Kanapaha Botanical Gardens to ensure that our investment in a children's playground for the gardens gets done properly and safely. There's been a lot of little breakthroughs along the way, and this week marked a few more. While Cleve managed to wrest away the assembly instructions from the manufacturers' middleman, Rick has been working on site prep. 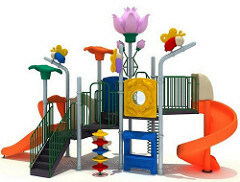 They met up on Monday in about 90-degree weather to begin assembly, which entailed deciphering and joining components of the play structure's foundation. That's what is pictured here, and it will be leveled and set in concrete at the site this week. Additional components kind of resemble a giant pile of Legos right now, but Cleve and Rick will get it figured out. Eventually, the rest of us can join in to spread a soft bedding of wood chips and landscape the berm around the structure. Thanks to everyone who is helping make this most worthwhile construction project possible.